After inktober I seem to have lost my crafting energy. I’ve got more caught up in TV and books. But this week I’ve been embroidering a cute little mermaid, designed by tamar nahir yanai. I bought it to make for a little girl who is turning 7 this month. I was drawn by the fact that it would encourage me to learn new stitch techniques as it included the cast on stitch and the woven spider Web stitch, which is never done before. Having done these I’m really pleased with the different texture these give the finished piece. I loved how the colours worked together. I wish I’d taken photos as I went along as the turquoise was the last colour I worked with and that made the whole design really pop. I’ve enjoyed having a little project that taught me new things but that I could do whilst watching rubbishy TV! Today I quickly knocked up a little zippered pouch. I’ve made a couple of zippered bags before and always used instructions (which doesn’t necessarily mean I’ve done them right!). Today it was part laziness (sewing equipment downstairs, phone upstairs) and partly the idea that if I figure things out for myself then I’m more likely to understand and remember how to do them. So here is the pouch I made with no instructions! It didn’t exactly turned out as I’d planned😂. For a start it was meant to have elephants on the outside and paisley on the inside. But the first attempt to sew the zip on went wonky and didn’t catch all the zip edge, and after one lot of unpicking I really couldn’t face a second lot when I realised the paisley was on the outside and the elephants on the inside. Oh well… Both materials are pretty so maybe I’ll mix them up! Now both are represented on the outside and both on the inside. I quite like it though! The zip edges are not as neat as they could be… I couldn’t remember how/be bothered to cover the ends with fabric. I finished it off with a bit of hand stitching, so there are no unfinished ends at least. Oooh this was fun… A project I could start and finish in one very quick sitting! 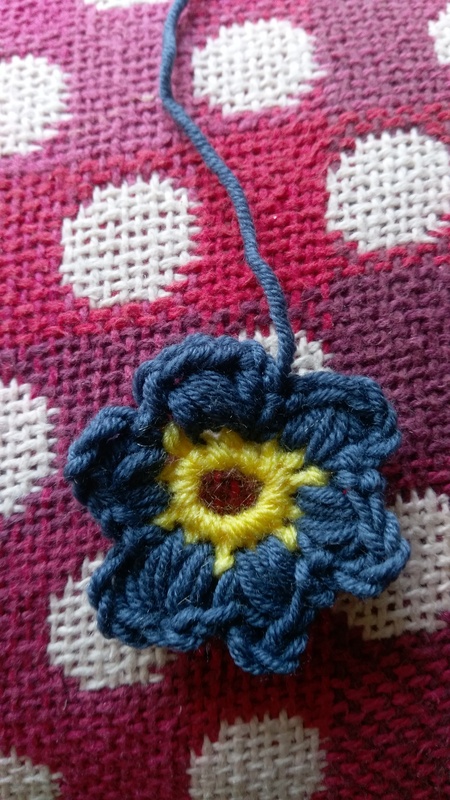 Thanks to kristabellashodgepodge I learnt how to make this very cute flower. Think I’ll be making more of these in the future in loads of different colours.